Sports Brain Lawyers - Jason Luckasevic | Prevent, Protect, Play! In Pittsburgh, sports are everything, the Steelers are everything. The members of the Pittsburgh community “bleed black and gold.” This feeling was no different for Attorney Jason Luckasevic, who had grown up in the Pittsburgh area. Because of the city’s love for sports, almost everyone knew about Mike Webster or “Iron Mike” as they called him. But what some may not know is that his career was the beginning of much more than his legacy of becoming one of the best football players of all time. Although Jason Luckasevic knew of the infamous Iron Mike, he too did not know that there would be more to Mr. Webster’s story, or that he would become part of that story. In 2002, one of Jason’s dear friends Dr. Omalu, a pathologist in Pittsburgh, began his normal workday only today was the day that would change his life forever. Today was the day he was going to perform an autopsy on Iron Mike. Not being a fan of football, Dr. Omalu was unaware of Iron Mike’s football legacy, but he did know who Mike was because of his troubled history that had been shamelessly aired in the media. As any other patient, Dr. Omalu began his work. When the cause of death is a heart attack, it is not routine to examine the brain, but Dr. Omalu decided to do so because of Iron Mikes publicity of a troubled nature after playing in the NFL. Dr. Omalu then discovered that Iron Mike had a disease now known as chronic traumatic encephalopathy (“CTE”). Just as a normal day for Jason Luckasevic, he entered his law office early and as routine, began to read the Pittsburgh Post-Gazette, only this time there would be more than just sports statistics and politics. This time, there was an article about his dear friend Dr. Omalu. The article ridiculed Dr. Omalu’s work, and his discovery of CTE. Jason Luckasevic did not appreciate the words used to describe his friend or his work, so that very morning Jason Luckasevic spoke with Dr. Omalu. 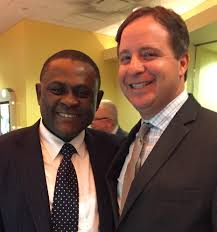 The conversation was short, Jason asked what Dr. Omalu was going to do about the unfounded words of criticism, and Dr. Omalu replied: “You’re a good lawyer, you figure it out.” And so he did. Jason Luckasevic began studying the devastating effects of brain injury in sports and together they worked to bring this issue to the forefront of the NFL’s attention. Luckasevic brought concussions in sports to national attention when he filed the first two lawsuits against the National Football League on behalf of more than 120 retired players for their CTE brain injuries. Because of his tireless efforts Jason Luckasevic is now the most sought after lawyer and expert consultant on sports brain injuries. Jason and his law firm, Goldberg, Persky & White (GPW), are dedicated to helping individuals and available to discuss your legal needs in a free consultation. Working with the best medical professionals allows Jason and GPW the opportunity to maximize the results for their clients. If you have any questions, you can get in touch by clicking here. Jason welcomes your media and professional requests and can be reached via email.